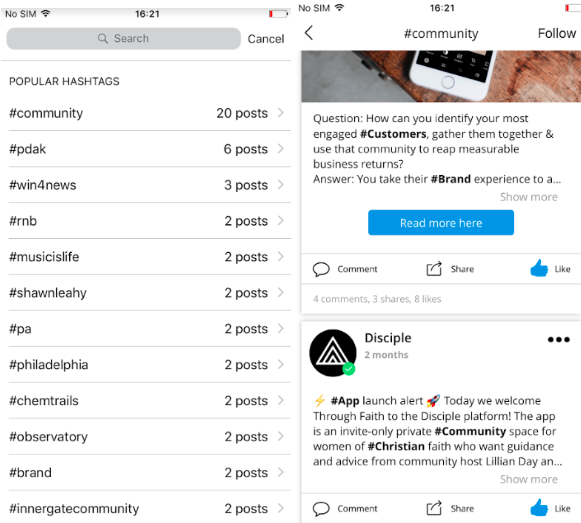 A quick guide on how to make the most of hashtags in your Disciple-powered communities. A hashtag is essentially a clickable, searchable keyword or phrase that is created by typing the # symbol at the start of a word or short phrase that contains no spaces or punctuation. Typing your word or phrase as a hashtag automatically turns that word or phrase into a topic or category and is added to an index of all the other times that hashtag has been used. This means that clicking on the hashtag will show you all the other people in the app who are talking about the same topic as you and they’re saying about it. Try to keep your hashtags short, snappy and catchy! The catchier your hashtag, the more likely people are to join your conversation. Using capital letters at the start of each word in your hashtag will make it easier for people to see what you’re saying. A lot of people like to just use lower case in their hashtags, but we think that #HashtagsAreAwesome is much easier to read than #hashtagsareawesome. But hey, it’s your hashtag so do your thing! If you're thinking about launching your own mobile community, please get in touch with us.